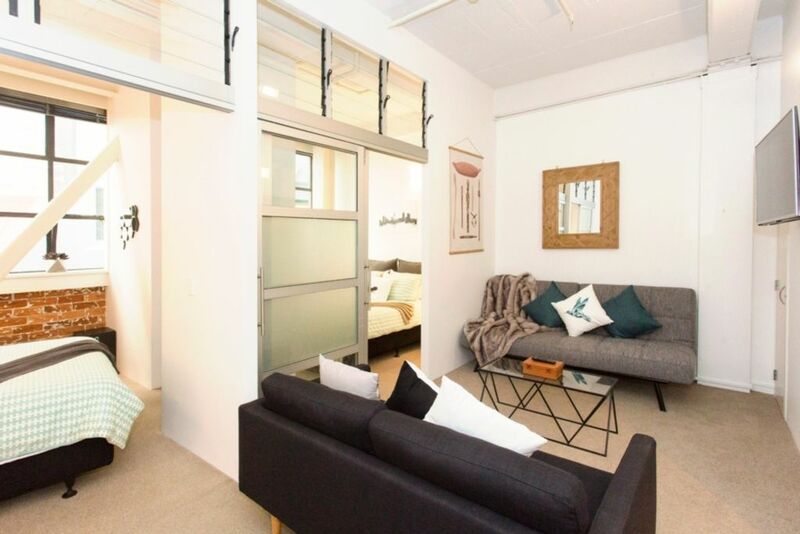 This two bedroom inner city retreat will feel like your own little hideaway from the hustle and bustle of Auckland City. The exposed brick work gives the apartment character and the high stud ceilings will make you feel as though you have plenty of space. Well located and just a short stroll from Britomart, the waterfront, Spark Arena & of course the many bars, restaurants and shops that Auckland has to offer. The location at the rear of the building means you are not exposed to any street noise... it's wonderfully quiet and peaceful - a real retreat in the hub of the city. The best things in life are comfy which is why you will love the pocket sprung Queen size beds with quality and professionally laundered bed linens in each of the two bedrooms. Enjoy the large LED Smart TV with Netflix, bluetooth audio system, free unlimited Wifi, board games and toys for the kids during your stay here. There is also a fold out sofa bed (futon) in the lounge. The kitchen is fully equipped whether you want to whip up a quick breakfast before you head off to explore Auckland or cook a full meal to enjoy with friends. There is coffee, tea, sugar, milk, cooking basics and we always leave you some tasty snacks to enjoy. Lost keys incur $150 replacement costs plus any locksmith costs should you lock yourself out. No pets and no parties or events. We are strictly non-smoking and there is a $1000 fee if anyone breaches this condition. Great little appartment with everything you need. Loved the attention to detail and the welcome treats were a bonus. Thank you very much for your review, we are very happy to read that you enjoyed your stay in our lovely apartment in Auckland. Great central location to Spark Arena, good sized apartment, lovely and tidy! Thank you very much for staying with us. We are happy you enjoyed your stay and the apartment. We would be happy to host again in the future! good location. very responsive hosts and they are concerned with your satisfaction. Small apt but enough space and good location to queen street and the harbor. Grocery store nearby-the countdown...very handy. Appreciated Bernadette's concern that we had the carpark remote and that we were able to keep it until 11am the day we departed. Clean and the snacks etc were super nice after a 20 hour long flight and considering my husband is diabetic, so having snacks around is a necessity. I would definitely recommend to others. Easy to get to from airport. Hello Barbara, Thank you for staying with us. We are happy you enjoyed the apartment - we would be delighted to host you again next time you visit. Thanks again. Kind regards, Emilie. Comfortable, cosy, clean, central location would use again any time back in Auckland.